I wish I was back in Taiwan. I loved the weather there, warm and humid. Instead, I’m here in Seattle, dank and chill. Still, since Taiwan, I’ve been more consistent on riding, and I intend to keep going. 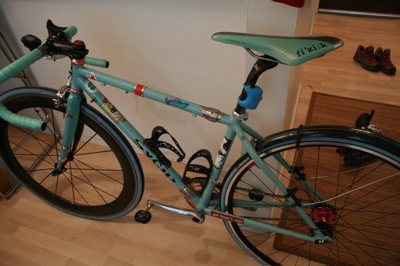 I finally had to give up and acknowledge the death of summer by putting the fender on my Sycip “modal concept” bike. I’m using last year’s SKS Race Blade XL fender, but I’ve improved it by securing it to the empty brake bridge with a bolt and wingnut in order to reduce rattling. The fender has enough space at the back that I can remove the wheel from the rear-facing dropouts without moving the fender. I kept the 60mm deep Hed rim on the front despite yesterday’s blustery conditions. I call it practice, a way of expanding the conditions in which I can effectively use deep aero wheels. If there’s any trick to riding aero wheels in windy conditions, I’d say that you should ride a low and long position on the bike. It puts more weight on the front wheel so it’ll jump less in a sidewind, and the hand position gives you more leverage on the steering axis.